Our LitCorps Ambassador Ruby Veridiano Joins The Girl Effect and Tara Sophia's Blogging Campaign! Our LitCorps Ambassador in Manila Philippines, Ruby Veridiano, has joined The Girl Effect and writer, speaker, and educator Tara Sophia Mohr in this month's blogging campaign on behalf of girls worldwide! It's more urgent than ever to offer girls new armor to protect the woman she is destined to become. I believe that every girl needs the kind of armor that is made of seven strengths: belonging, curiosity, sisterhood, kindness, confidence, courage, and hope. These seven strengths are the kind of values that I teach when I work with young girls like Natalie. Through the work I do with the Girls LitClubs project through Global Literacy Organization LitWorld, I am being granted an opportunity to build a protective, lifesaving device for young girls, arming them with a strong sense of worth, determination, and self-love. I am able to give her one of the most valuable gifts any girl can have: a space where she is celebrated and honored for being who she is, and for the incredible potential she holds. This is the spirit of THE GIRL EFFECT, a ripple that will create waves for young women the world over. To read more, visit Ruby's blog here. 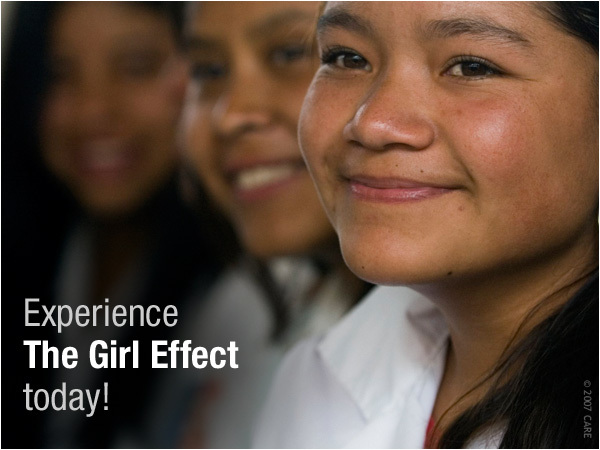 To join the The Girl Effect and Tara Sophia Mohr's blogging campaign, visit here. Newer PostExpand the Red Rose Library in Kibera, Kenya: Donate to Hue-Man Bookstore! Older PostNobel Peace Prize Awarded to Three Activist Women!